pass an arduous comprehensive one day written test. pass an ethics background check performed by the TBLS. Additionally, the TBLS requires Eric Reyes, as a board certified attorney, to remain involved in personal injury law and be periodically recommended by other attorneys in this field. The TBLS also requires a board certified attorney to take continuing legal education courses to remain updated in the area of personal injury trial law. Eric Reyes is also double board certified by the National Board Of Trial Advocates. (NBTA). Eric Reyes is Board Certified in Civil Law by the NBTA. Civil law is the body of rules that exist in state and federal statutes, regulations and court made law that governs the rights and remedies between private people, government, and corporations. This includes injury law. The law that controls the rights and remedies of injury claims in Texas. Additionally, the NBTA certified Eric Reyes on February 9, 2018, in the area of Civil Practice Advocacy. 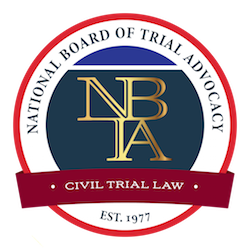 This was previously named Civil Pre-trial Practice.The area of Civil Practice Advocacy includes litigation pleadings, motions, depositions, hearings, and mediations. pass a thorough one day written test. pass an ethics check performed by the NBTA. submit a legal writing sample that exhibits expertise in Civil law. Why is it important to hire a board-certified lawyer? The legal profession, like the medical profession, contains a very large body of knowledge that makes it impossible for one lawyer to concentrate in all areas of the law. The Texas State Bar that regulates the legal profession does not require an attorney to complete any formal board certification or training to practice in any particular field of law. In Texas, the attorney’s decision to be board certified in any area of the law including personal injury law is purely voluntary. The medical profession by comparison has embraced specialization for over a hundred years. Over 94% of all doctors are board-certified in their area of expertise. Consumers therefore have the confidence that the doctor treating their condition is truly qualified to treat their health care problem. However in Texas, less than 8% of the 70,000 lawyers licensed to practice law are board-certified. There are eighteen areas of law that an attorney can apply for board certification ranging from criminal law to bankruptcy. Fewer than 3% of all attorneys in Texas are board certified in personal injury trial law. Despite the fact that relatively few attorneys are board certified in Texas , most attorneys in Texas do concentrate their practice in specific areas of the law. But they do so without official substantiation beyond self promoting advertising that they take specific types of cases. Lawyers in Texas are free to accept any cases in any area of the law. Potential clients are forced to rely on word of mouth or by an attorney's advertisements when they are seeking legal representation regarding their case. What is a consumer to do? By selecting a Texas board-certified attorney, a client possess the confidence that his lawyer has passed a rigorous substantive test in the area of law of his speciality, passed a professional review among his peers and judges, passed a thorough ethics investigation, and submitted documentation of his legal experience. Call him for a free consultation. Eric Reyes has offices in Fort Worth or Dallas, Texas.